I hired 2 Cabinet Girls to covert my old drab kitchen into the 21st century. I was not confident in my own color selection skill so Kristen offered tips on what colors would match my existing walls/floor/counters. I choose Light Pewter (light shade of gray) and it looks fantastic. 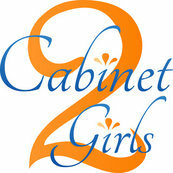 I would highly recommend using 2 Cabinet Girls. The team was professional, arrived on time, didn't leave any mess and the cost was very affordable. Thanks Olivia. You were an absolute pleasure to work with! Thanks Joanne. You were a pleasure to work as well!